With more than twice the power commonly found in this size of laser cutter the Blu70 delivers twice the cutting speed and cuts thicker materials more safely. With its 60w DC CO2 laser, Blu70 has more than twice the power of a 25w RF laser alternative commonly found in this size of laser cutter. This allows Blu70 to deliver twice the cutting speed and a capacity to cut far thicker materials more safely. Compared to a 25w RF alternative Blu70 is often £4k-£5k lower in price too. At 700x500mm the working area of Blu70 is considerably larger than a typical entry-level machine and utilises the same motion system as the larger Blu100 model. Blu70 engraves with good quality but is primarily designed as a cutting system for processing of sheet format materials. With a standard lens of 63mm f/l a range of optional, interchangeable lenses of 38mm, 51mm and 102mm are also available to provide for a variety of beam profiles and focal point sizes to cover all of the most likely applications. 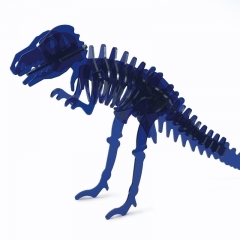 What makes a Blu laser cutter so special? Designed, assembled, configured and tested in the UK to CE and RoHSII regulations and pending certification after testing by the TUV quality authority, Blu DC is a robust laser cutter from a manufacturer with over 20 years experience exclusive to laser cutting, laser engraving and laser marking technology. Call and arrange an appointment to visit our Basildon factory to see for yourself how much time and effort we put in to building a Blu laser cutter. Can Blu be lifted up stairs or situated in hard to access areas? What is LEV and what is P601? LEV (Local Extraction and Ventilation) are a set of COSHH regulations enforced by law for any device that is used to remove potentially harmful contaminants from the workplace. Under the law any device falling within the scope of LEV must be tested and certified at minimum every 14 calendar months and records for such tests held of a minimum period of 5 years. Failure to adhere to the requirements is punishable by law with significant penalties including imprisonment. A professional accreditation called P601 exists whereby certified engineers have undertaken and passed rigorous training and testing to the LEV standards. We therefore recommend that only P601 certified contractors are used to test/certify devices under LEV regulations. Why don’t you have auto focus as a feature for Blu? We do not offer auto focus as a feature primarily because it does not work well. Machines that use sensors will only scan a small section of the material and find the highest point and such devices will not work well with transparent materials, like clear acrylic. Machines that use probes add excessive weight to the focus carriage that deteriorates performance and output quality as well as not allowing processing of some parts as the probe can collide with the part. Machines that use focusing by software are prone to expensive accidents when a head collision with the table occurs. We feel our design is simpler, safer and more practical to use and by not having auto focus Blu is less cost to purchase too. Why do you call Blu a laser cutter when it can also engrave? 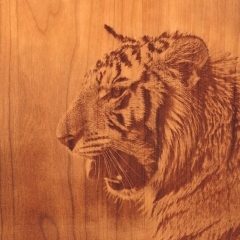 Blu is designed primarily as a cutting laser that can engrave, which is why for laser cutting applications it can often outperform other plotter format lasers that are x3 or x4 its cost. This is because those alternative machines are primarily designed as engraving lasers that can cut. Despite what others may claim there is a difference. Good engraving lasers in a plotter format will have a lightweight focus carriage and either no air assist or a very narrow air assist hose. Our focus carriage is heavier because it carries a large diameter hose and a heavy duty nosecone, which is better for cutting. Blu also incorporates a DC laser source, which is good for cutting. RF laser alternatives are better for engraving because the RF technology can deliver a faster pulse (pulse rise/fall). Higher power DC lasers are more affordable but RF lasers are not. Generally, cutting sheet materials like acrylic does not require a laser with a fast rise/fall; more benefit can be had from having a higher power in Watts. Therefore the design of Blu is primarily for cutting applications, hence why we call it a laser cutter. Why don’t you offer a rotary device with Blu or a table that can drop very low? 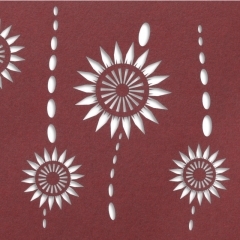 A rotary device is primarily used for engraving applications. Blu is not designed as a laser engraver; its core design is for cutting sheet materials <25mm thickness. 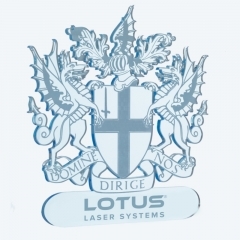 At Lotus we specialise in the technology of laser materials processing, so we have other designs of machines that do have rotary devices and greater material clearance. Why is the DC CO2 laser within Blu warranted for 1 year when others are 10 months, 6 months or even 3 months? Some DC lasers can be purchased for less than £100 but typically these will be of a very poor design and manufacture quality. Some manufacturers of such products warrant them for only 1 month so they are often out of warranty before they are even fitted to the machine. It is therefore left to the reseller to offer the warranty and to lower their risk some will offer purchasers short warranty periods. 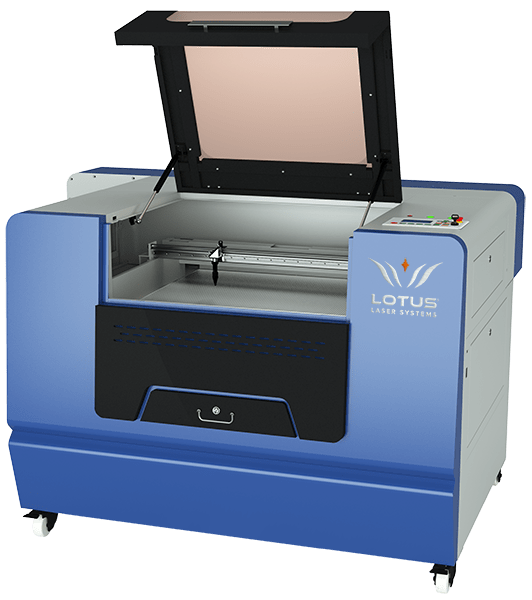 At Lotus we take great care to buy well made lasers from reliable sources but even so, we then grade in-house all of the lasers that we purchase. Unfortunately, this does result in us rejecting some of the lasers we buy, which adds to our costs. As a result of our strict QC process we have installed machines where the DC CO2 laser has lasted in excess of 2 years so we are confident to offer a 1 year warranty for all of our DC CO2 lasers. Does it matter which size and type of filtration device I use? Yes; it is extremely important that the performance of the filter unit and the size/type of media within it are carefully matched to the size of the laser cutter as well as the type and volume of fumes produced by the core application. If I do not use a filtration device can I use a small fan to blow the fumes out of a window or wall opening? Absolutely not! Installations like this are extremely unsafe, break regulations and laws. Where fume extraction is to the atmosphere an industrial grade blower with professionally designed and installed duct work is essential. Does underside extraction and a high flow air assisted nosecone really make a difference? Absolutely yes! Especially for high debris applications such as cutting wood and also for high risk applications such as cutting very thick acrylic. When paired correctly the downdraft of the underside extraction will draw fumes away from the material while simultaneously the air from the nosecone will push fumes down through the cutting path. As a result the material is cut cleaner, the machine optics and mechanics suffer little if any contamination and even the cutting speed can be improved too. Having these features is often essential for some applications but good design is key too. Ideally, for maximum efficiency of underside extraction the air should be taken from the centre of the work table through a funnel shaped device with side of equal shape. Equally important is the diameter of the hose that delivers pressurised air to the nosecone; too thin in diameter and the air volume is restricted. Some systems have extremely thin air assist hoses that renders the feature near to useless. Why should I use Lotus Cut software instead of a printer driver? Why is the Lamella Bed better than a Honeycomb Cutting Table (HCT)? Most HCT on the market are made from a weak aluminium material that is designed to be laminated between two rigid boards; i.e. it was never intended to be used as a laser cutting table. This material damages easily, cannot be cleaned and deteriorates very fast, therefore it requires frequent replacement that is often costly. The more that you use a HCT the faster it will deteriorate. As the cells of the HCT deteriorate they cause increasing back reflection that can damage the underside of the material; they cause defocusing of the laser and can even cause flaming (fires). By contrast lamellas are strong and cannot get damaged with normal use; they can be removed to totally prevent backward reflection and they can be cleaned. If well maintained lamellas will last the lifetime of the laser cutter. Why are the lenses and mirrors that you use in Blu so expensive when I can buy the same products on eBay for a fraction of your price? In short; it’s unlikely that you are comparing like with like. As with DC CO2 lasers, laser optics come from many different manufacturers and while they may look the same they certainly are not. A poorly manufactured laser optic (lens, mirror, beam combiner) will at best attenuate (drain) laser power resulting in slower cutting speeds and reduced laser cutting performance. At worst such optics will deteriorate very fast requiring more frequent replacement. In some cases laser optics can catastrophically fail causing further consequential damage to other system components. Given that good quality laser optics fitted to a well set-up and maintained laser cutter should last a number of years, we feel it’s not worth compromising performance and reliability for the sake of using lower cost optical components. Why can I see Blu machines on other peoples web sites? We operate a growing network of authorised sales and support partners around the world, all of whom will advertise our products on their independent web sites. Where you see the Lotus registered trade mark you will likely be looking at a genuine Lotus Laser System. Unfortunately, as with most successful brands ours is subject to copy and counterfeit so if you are unsure please contact us for verification before you make a purchase. Please note that we do not support illegal copies of our products no matter what circumstances surround the purchase. All Blu model laser cutters come with easy to use, feature enriched Lotus Cut CAD/CAM software. Unlike the alternative print driver type machines, using our software provides far greater compatibility with common industry artwork formats, extra functionality to alter drawings at the laser cutting machine without having to open an expensive graphics package and, best of all, powerful optimisation tools to minimise process times, reduce errors and enhance output quality. DIY installation of a DC laser cutter is almost certainly a recipe for disaster in one way or another be it incorrect set-up leading to faulty operation, premature component failures or simply poor performance due to a lack of understanding of how best to use the laser cutter and its control software. Our support starts before the laser cutter is delivered as we help the owner with pre-installation advice to provide the optimal environment for the machine. We use professional delivery staff and supply expert installation and training to help the owner avoid unnecessary and sometimes costly inconveniences. At Lotus we spend considerable time and money to factory train our staff and resellers. We even have staff trained to P601 LEV accreditation. All Lotus Laser Systems come with unlimited remote (phone/email/Skype/etc) factory support for the lifetime of the product. Our warranties are wide in scope and we offer warranty upgrades to 5 years for all parts and labour including the laser as well as preventative on-site maintenance packages so that all Lotus owners can tailor support to their individual needs and get on with using the laser cutter rather than worrying about how to fix it. We invite you to compare the weight of a Blu laser cutter to alternatives and you will appreciate that Blu is ‘built like a tank’. We design these machines to last. Not only affordable to purchase, Blu laser cutters are also extremely low cost to own and maintain too. With thousands of machines in the field and with the help of our highly skilled support resources our customers report near zero failures even for machines that have been installed for 10 years or more. Copyright Laserite Ltd, registered in England 3136255. All rights reserved. VAT no. 676202535. Find out which of our machines would suit your needs the best! Enter the information required. What will you be using the laser for? What will you be cutting? Need a little more information? Request a call back and we will be in touch within the next 24 hours.